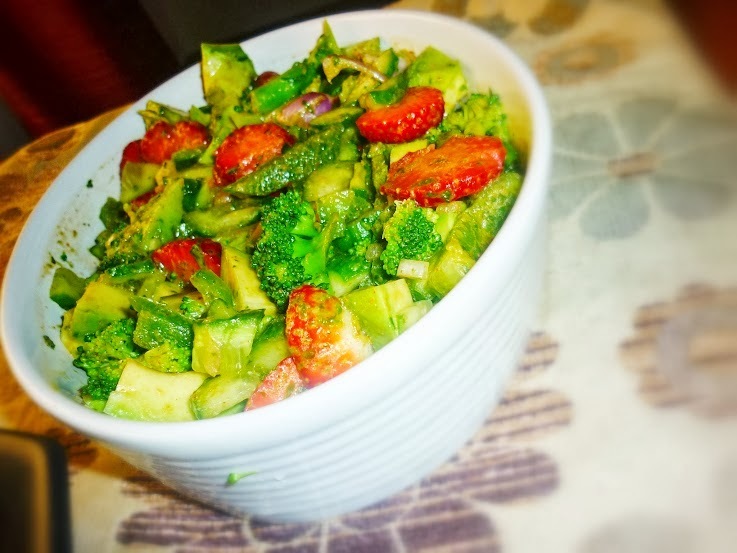 Healthy Salad recipes can be a treat .Experiment this quick Avocado salad with ingredients you prefer like almonds,pine nuts etc. Avocado contains good cholesterol (HDL) with great taste. Boil water with a pinch of salt and vinegar. Let broccoli florets blanch in this boiling water for a minute. Cilantro Lime Vinaigrette is a simple yet delicious as well as healthy salad dressing. Cilantro is one of Nature’s best anti-oxidant foods. In simple words, Cilantro or coriander leaves, protect us from ageing, cancer, heart disease, diabetes, arthritis, macular degeneration, Alzheimer's disease, and many more. • For another healthy salad visit here. 1. Cut all the veggies into small cubes. Add blanched broccoli. Puree coriander leaves, garlic,lime juice, salt ,pepper and olive oil in a blender until smooth. 3. Top the veggies with this dressing and serve chilled. Eat Healthy Live healthy .